From Oakland’s Oscar Grant Plaza to the LA Convention Centre, through neighbourhoods all across California, the #CaravanForJustice and its UK Justice Team developed the links and relationships necessary for international solidarity around the issue of state violence. Each stop brought the experiences of family members who have had loved ones die at the hands of police in England together with communities that have long suffered state violence in the US. 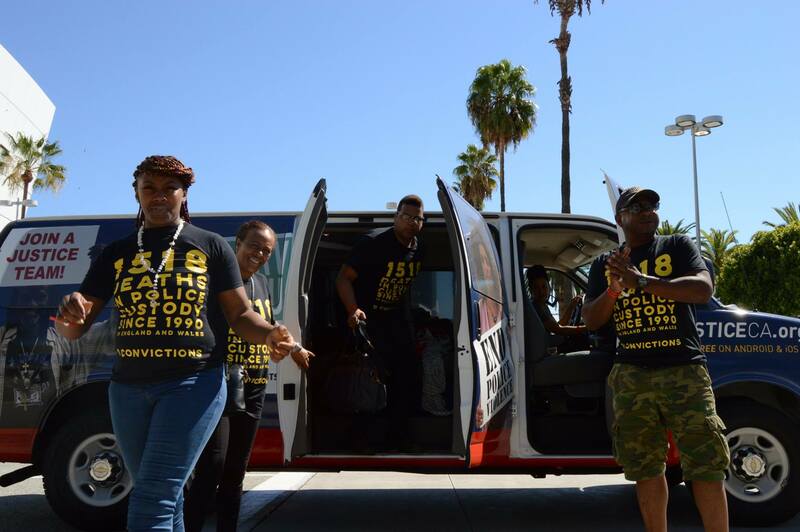 Activists working across various organisations – including #BlackLivesMatter chapters, the Ella Baker Center for Human Rights and the American Civil Liberties Union – are engaging in their communities in California to mobilise justice teams that will hold law enforcement to account. Patrisse Cullors and Taina Vargas-Edmond of the Ella Baker Center are heading up a ‘truth and reinvestment’ program that encourages a collective recognition of historic and contemporary racism whilst also divesting from those state resources, such as police and prisons, which perpetuate this racism and violence institutionally. With Theresa May’s announcement today of an independent review into deaths in custody chaired by Dame Elish Angiolini, those still campaigning for justice want to highlight these demands which are yet to be implemented despite decades of recommendations. Having returned, the delegation that took part in the #CaravanForJustice tour through California is now mobilising for the annual UFFC procession on October 31st – from Trafalgar Square to Downing Street. The procession each year acts as a memorial to those who have died in custody as well as a reminder of these deaths to those empowered by the state to bring an end to them. The uncle of Oscar Grant, a 22-year-old shot dead by police in Oakland on New Years Day 2009, Cephus ‘Uncle Bobby’ Johnson will be flying from Oakland to London in support of the march along with Beatrice Ann ‘Aunty B’ Johnson. The UK justice team (including Kadisha Brown-Burrell, Stephanie Lightfoot-Bennett, Marcia Rigg and Shaun Hall) met Uncle Bobby and Aunty B at the first rally of the tour in Oakland. The UFFC procession will be the first in a number of opportunities to bridge this gap between the fight for justice in the US, UK and hopefully beyond. UFFC and supporters have also organised a screening (and Q&A session with Uncle Bobby) of the film Fruitvale Station, which dramatizes the last day of Oscar Grant’s life. An evening of celebration and performance, including Akala, will also follow the UFFC march on October 31st.